As the internet has grown more and more important to modern life, a backlash has arisen. The “I Quit Facebook” article has been a popular genre of think-piece practically since the social platform existed, but it has picked up momentum in the past few years. Quitting Twitter and its relentless drumbeat of retweets is another popular movement, and just this week, Vice writer Eve Peyser wrapped up a week-long sabbatical from the entire internet. Virtually every article’s author — whether or not they advocate for unconditional quitting — found that their life became more relaxed without the pressure of the always-on internet. You can see where this trend is going. Opting to live an entirely internet-free lifestyle sounds like it could be a health nut’s dream. After all, with rising levels of anxiety and depression, the younger generation has already begun supporting health-centric businesses. Meditation app Headspace is a $250 million business, and an entire suite of apps exist solely to help you cut down internet time. Could a life without the internet be possible? As it turns out, eleven percent of America has already answered that question: That’s how many never use the internet on a regular basis. Thanks to a new report from the internet’s watchdog, Pew Research Center, we have a clear look at the four different demographics in the nation that are most likely to never use the internet. Granted, all of them are still more likely than not to be on the internet, but of those who aren’t online, these traits are the most common. According to Pew’s January 2018 survey, 34 percent of Americans 65 years of age and older are not getting on the internet. They’re the largest age group to stay offline by a wide margin: 50-to-64-year-olds are next in line, at 13 percent. It’s not a shocker: The internet hasn’t been a cultural must for long enough that seniors would have felt the need to master it. Still, the number has dropped seven percentage points since the last survey in 2016, and the 56 percent of 65-year-olds that are on the internet remain a significant number. Out of the four different groups named in this article, seniors are the group that is the least likely to continue staying offline: By the time Millennials begin hitting retirement homes in fifty years, they’ll be glued to their memes — though I assume they’ll rely on a voice assistant interface rather than an arthritis-hostile touchscreen. 19 percent of those making $30,000 or less each year opted to never use the internet. Given that the Census Bureau’s latest estimates put the number of Americans living under the poverty line at 43.1 million — and given the annual income threshold for the poverty line is well below $30K — this demographic makes up a lot of America’s 11 percent of never-online citizens. 22 percent of those in rural locations never use the internet, according to Pew. That’s compared to 10 percent of those in suburban areas and 8 percent of those in urban locations. This might not be surprising, given the correlations between rural areas of America and a lack of jobs or, as the final demographic touches on, education. 35 percent of those with some or no high school experience also don’t get online. 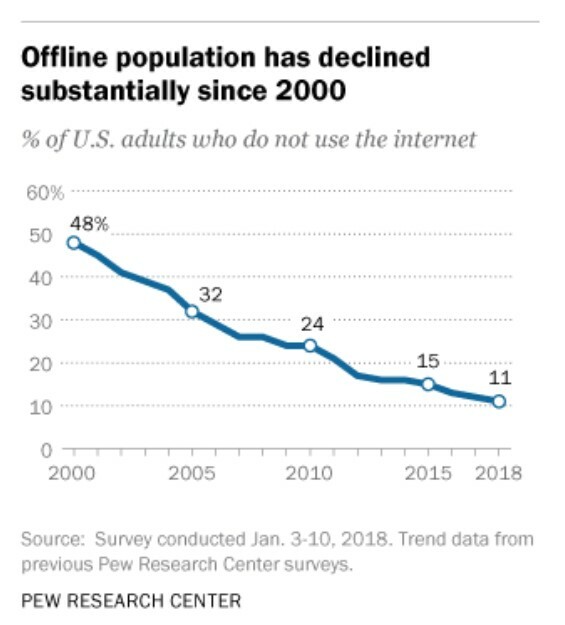 Interestingly, that share has dropped like a rock since the same survey in 2000, when 81 percent of those without high school education didn’t use the internet. Internet users don’t need no education. This Pew data backs up earlier self-reported reasons given for why respondents never use the internet. Those without a high school education likely aren’t working internet-based jobs, while senior citizens consider themselves too old, and those with little earning power find it too expensive. The life of someone who avoids the internet, overall, does not seem to be a glamorous one. Granted, if you hope to stay entirely away from the internet’s watchful eye, you’ll have a tougher time than just moving to a $30K job in a rural area: Even those who haven’t touched a mouse-pad in their life are likely cataloged online. 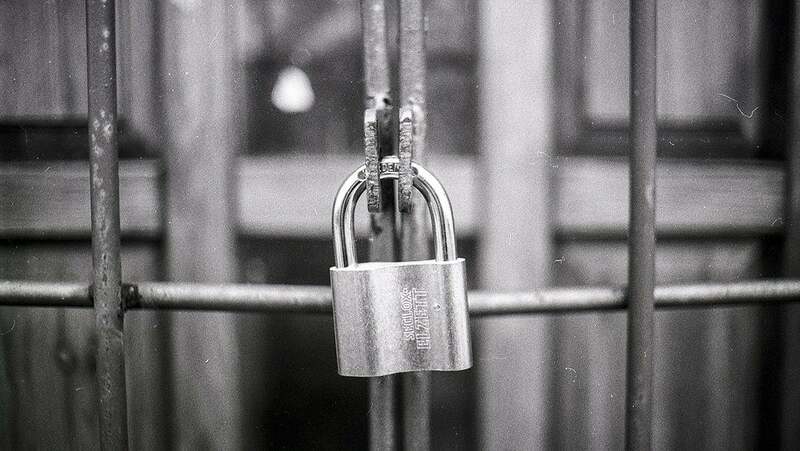 Here’s a list of potential ways your own identity is exposed on the internet. Publicly available government records. Do you own a home? Do you vote? Do you have a criminal record? Or anything so much as a speeding ticket? You’ve got a government record. Internet mapping services. You can likely find a few photos of your house on Google Maps. Phone numbers. If your number’s in a phone book, it’s online. Try Googling it to see if any additional information online connects it to you. Extracurriculars. If you volunteer with or donate to a charity organization, join a church or join a sports team, their website might mention your name. Relatives. If anyone in your family is a Facebook addict or even if any in your distant family has tracked their genealogy, information about your identity and your family ties may have found its way online. And I’ve got bad news for anyone hoping to hide their old life: Not only is that 11 percent of non-internet users likely to keep dropping in the future, as the senior citizen holdouts pass away, but growing reliance on facial recognition technology is going to really put a dent in your ability to be anywhere without the internet noticing. Ultimately, the dream of an internet-free life is, in reality, pretty depressing. The best way to drop off the Google map is to be in a demographic that internet-era businesses don’t care about as much. To put it bluntly, be old, poor, or minimally educated.